St. Regis Maldives Vommuli is one of the newly opened contemporary resorts in the Maldives, also the first of the St. Regis Brand to have it's own private island resort. It is located in the southern part of Maldives in the Dhaalu Atoll, approximately 45 minutes by seaplane. What I love the most about this amazing property is its architectural design - St. Regis Maldives has been recognized the world over for its unique eco-aware design. What truly sets this hotel apart is its how they incorporate innovative design that merges both contemporary architecture and local Maldivian inspiration. A fine blend of elegance and exotic Maldivian charm! The architecture of all places and venues around the island is themed at marine animals. Take the sunset bar, for instance, which is shaped like a whale shark, or, the splendid library lounge sculpted in the form of a seashell. Even the carpets are laid in the form of waves wandering in the vast limitless lagoon! There are as many as 7 different types of accommodations and two beautiful estates in the resort- the John Jacob Astor Estate and the Caroline Astor Estate, named after the founder of St. Regis hotels and his mother respectively. What’s more, the John Jacob Astor Estate, also known as the presidential villa, is the largest overwater villa in the Maldives with as many as 3 separate bedrooms and an individual sundeck with a swimming pool and a jacuzzi. The Caroline Astor Estate is the beach house version of the John Jacob Astor Estate and is equally stunning. Designed by WOW Architects ׀ Warner Wong, the resort features 77 island and overwater villas and each individual villa comes with its own private swimming pool. 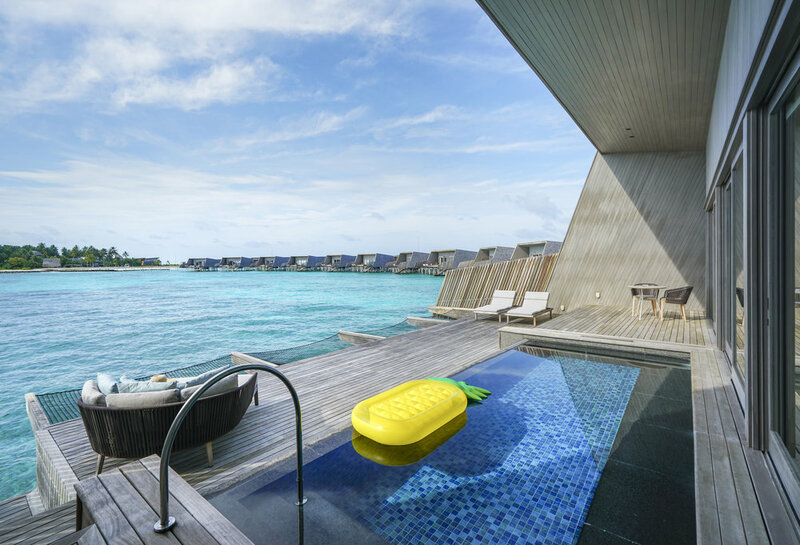 The design of the water villas resembles a manta ray - the shape of the room extends out on both sides to create the feeling of swimming in the ocean, allowing guests to literally feel as if they were at sea! The beach villas are designed around modern fish huts adorned with high ceilings providing guests with ample space and privacy. All decor and interior design reflects the patterns and textures that can be found around the island, such as the use of recycled glass beads, the exquisite coral chandeliers, the use of natural light, etc… You literally live the Maldivian paradise from within the villa, showcasing a beautiful balance between contemporary living and island life. St. Regis Maldives boasts the Iridium Spa. It’s not like any other you would have seen before though - this overwater spa and wellness center will rejuvenate your mind, body, and soul right in the lap of the Indian Ocean! Guests can choose from a variety of therapeutic treatments on offer including facials, massages, and hydrotherapy. In fact, the Blue Hole Pool, situated on the resort terrace, is one of Maldives’ largest hydrotherapy pools, which offers you panoramic views of the surrounding ocean. The St. Regis Maldives houses a Yoga and Meditation Studio, a great place to meditate and practice Yoga amidst the tranquil island surroundings. The studio organizes classes for individuals and groups. The Anti-Gravity Yoga activity is highly recommended to lift the spirit! There is also an in-house fitness center with state-of-the-art gym equipment. You could even play tennis in the charming outdoor tennis court nearby set amidst lush greenery. Fitness enthusiasts must also look out for Jumping Fitness- a unique fitness training system, the first of its kind in Maldives, which is a great way of cardio training using sprints and jumps set in different paces. It’s an effective way of cutting body fat and staying energized all day long! Socialite is the 24-hour recreation game room where guests can enjoy table tennis, pool, foosball, and a variety of video and audio games while the Children’s Club keeps kids entertained with creative art activities, cooking courses in an exclusive children’s kitchen, and even Yoga classes designed for kids. Alba, located in the heart of the island, faces the main pool and the ocean. An Italian restaurant that offers both à la carte and buffet breakfast. The restaurant is known for the great selection of international cuisine for lunch and dinner. Decanter serves a five-course continental menu with wine pairing. Oenophiles and liquorists will be delighted with the lots of wine selections on offer including some exclusive wines dating from 1755. Orientale is an Asian restaurant that features 3 unique kitchens - from the aromatic curries and biryanis from Indian and Pakistani cuisines, the Japanese sushi bar, to seasonal selections of the exotic Cantonese, Sichuan, and Korean delicacies that use authentic ambrosial flavors from these regions. The Whale Bar is definitely the best spot to enjoy picturesque views of sunset on the island. Besides savoring drinks, guests can also enjoy a 3-5 course set menu or tapas prepared by the Executive Chef Ayyoub Salameh. Highly recommend trying the island twisted St. Regis Bloody Mary spiced with the Kala Namak salt, a distinctive seasoning that's popular in South Asian cuisine. Cargo is a great option should you wish to enjoy Middle Eastern Cuisine under starlight. Crust is an outdoor beachfront pizzeria, where guests can order and custom make their own favorite pizzas with inspired toppings such as tandoori chicken or Maldivian tuna. You can even enjoy sandwiches and snacks with cold draft beers and fresh juices!